Food Costs > How Much Does Coke (Drink) Cost? How Much Does Coke (Drink) Cost? Coke, which is short for Coca-Cola, is a type of soda or pop. Coke is not only popular in the United States, but around the world as well. The formula used to make Coke was originally developed as a form of medicine. When that did not work out, the makers, John Pemberton, realized that it made a great drink instead. On average, Coca-Cola is going to cost anywhere from $1 to as much as $2+ per 20-ounce bottle, depending on your geographical area and where you purchase it. In a vending machine, for instance, it could cost up to $4 at an amusement park but much less if you were to purchase it at a shopping mall. Generally, as long as you’re not at a touristy type attraction, the costs of a 20-ounce will always be less than $2. A 24-pack of 12-ounce cans will retail for $8 to $12. A 12-pack can be half of that or even much less if it were on sale. A 2-liter can cost anywhere from $1.25 to $2. Copytechnet.com states that a 20-ounce bottle of Vanilla Coke costs about $1.39 in Southeast Georgia. Depends on the store where you buy it, it is going to range differently. For instance, a can of Coca-Cola is more expensive in a convenience store compared to the grocery store. Events held at large venues tend to be the most expensive place to purchase a soda. Although there is a standard retail price, a glass of Coca-Cola will vary from one restaurant to the other. Expect to have a more expensive glass of Coca-Cola in a five-star restaurant compared to your favorite local deli restaurant. 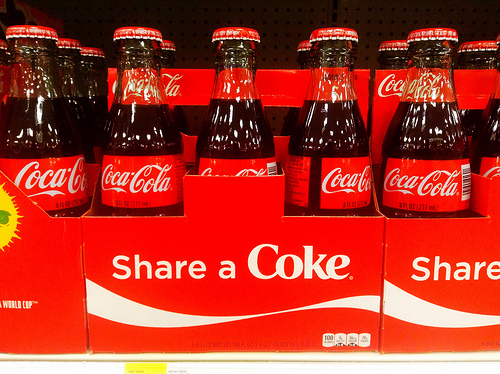 Coca-Cola products come in different sizes such as 12 or 16 ounces and the price will vary. The price will also vary if it is in a bottle or in a can. There are other Coca-Cola, aside from the regular Coca-Cola products, such as Diet Coke, Caffeine-free Coca-Cola, Coca-Cola Cherry, Coca-Cola Zero, Coca-Cola Vanilla, Lemon Coca-Cola, Lime Coca-Cola and even Coffee Coca-Cola. These different products may cause you more compared to buying the regular Coca-Cola. Coke can be served in many forms and available in many sizes. The most common forms are in a can, a plastic bottle or served as a fountain pop. Each can of coke can be the regular 12 ounces or can come in smaller 8-ounce cans. A plastic bottle of coke commonly comes in 20 ounces or a 2-liter container. Coke can be sold in grocery stores, convenience stores, vending machines and restaurants all over the world. Because of the reputation of the Coca-Cola company, each can of coke comes with a satisfaction guarantee. If you are unsatisfied with the product for any reason, you can call Coca-Cola company, discuss your issue, and possibly be reimbursed for the product. Buying in bulk, as with any drink, can save you the most money. The more you are able to purchase, the more you can save. Check warehouses such as Costco and Sam’s Club. Canned products tend to be more expensive per ounce compared to the bottles and 2-liters. Most grocery stores often hold sales for these products. If you can wait, try to purchase them on sale. This is especially true when there are holidays such as New Years or popular events such as the Super Bowl. Dollar Tree locations have 20-ounce Coke products for $1.